You defined a clear vision of your companies future AND had a way to model how to make it happen. Could you leverage this data driven information to your competitive advantage? Would you be able to justify the necessary investment needed to fulfill your strategic mission? What else could you do armed with information at your fingertips that your competition can't even envision? We have the tools and the process to make this happen NOW! eVSM, is a sophisticated, cutting edge technology that allows you a look to the future. Following the product through the Gemba with paper and pencil to collect data and observe actual conditions is how value-stream mapping (VSM) is done. But for a long time, members of the Lean Community have been sharing these hand-drawn maps by creating their own electronic templates from scratch in various software programs. eVSM makes the process of turning hand-drawn maps into electronic ones easier, faster, and standardized, complete with automated calculations, charts, and reports. 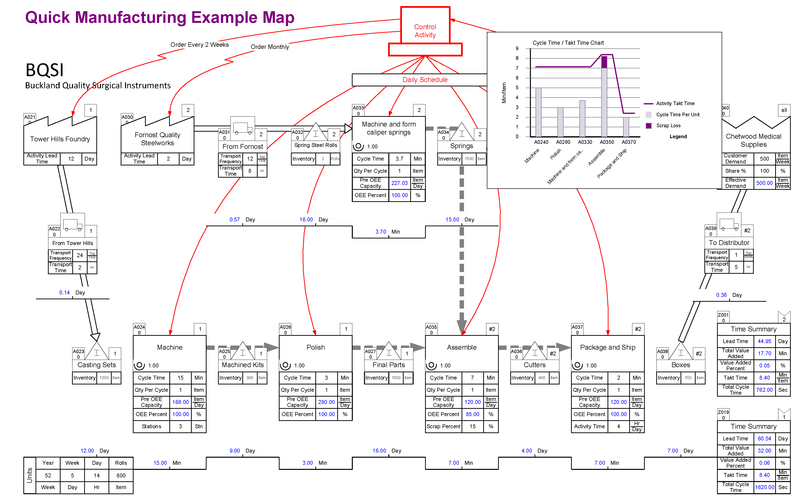 As a companion - not a substitute - to paper-and-pencil mapping, the software supports lean practitioners in capturing, analyzing, and improving the value stream. Visual versions of lean tools (Quick changeover, Plant Milkrun Design, Layout Planning, Kanban calculation, EPEI) to help design the improvements.